I was working in a project for last couple of months, as the days are passing the codebase is getting larger. Suddenly I thought, It would be great if I can know how many lines of code I have written so far for each module. And also in total. 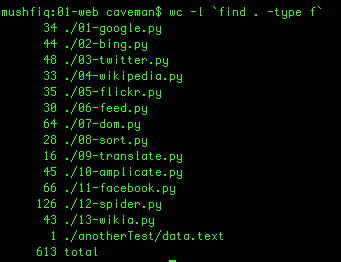 I know unix has a really awesome utils named wc. For learning these tow unix command in details check wc and find manual. Python super keyword is confusing some time to newbie or even for intermediate python programmers. b is an Object of class B and fancy_func is the method of B, super is returning the base classes method. If we don’t use super,we had declare an object of class A and then we had to call fancy_func. On the other hand,super returns proxy object. Super uses __mro__(method resolution order). In multiple inheritance its very useful in during dynamic execution. For real life coding when we need to enhance any module method we can easily super to get things done. And we don’t even have to know details about the base class that we are extending from. If you declare a __init__ in your python class, it will be run when you initialize an object from that class. Simply __init__ is used when we want to control the initialization of the class. In the above example we implement both the concept of __init__ and super. Here __init__ using for setting value of url while intilazing the object and super is being used to call the crawlPyCentral’s getTitles. Last year while I was working in a project, I needed to automate the whole backing up process from taking snapshot of the current db to saving it to AWS S3 buckets. At that time I took most of the staffs from this blog post. I reused this script, all I did just added a new function which copy the current backup data to a remote server. And also updated do_cleanup, now it works in any year. The backup script depends on other two js (fsync_lock.js and fsync_unlock.js) functions which responsible for locking mongo during db snapshots and releasing lock after the snapshots. We use design pattern to build reusable solution. Building reusable solution is hard and design patterns helps us by giving common design solution for same sort of problems. When to use factory pattern? There are couple of cases when we can use factory pattern, one of the case is- when there is needed to create objects that are dependent on other objects. Ideal situation would be, when we see we are coding to gather information to create objects. And factories help to gather object creation in a single place. And also it helps to create decoupled system. If you have better understanding and experience of using factory pattern in your python code, please share it in comment. I was working with a django application where I need to merge two query set. After going through django ORM docs, could not find anything helpful. Python itertools is an amazing module that contains real handy methods what we need to handle iterators and doing different types of operation. If you never used itertools before you are missing one of the charm of python. Check Itertools chain docs for details. May be it was end of the last year, I was assigned to finish a wordpress project which was taking way too long time to deliver. I was away from wordpress development for more than two years. So after jumping into the project I found most of the user requirements are bit different than the general. One of the requirements was to wordpress admin should be able to use “admin comment” section to reply the comments as email whether the user is subscribed to the post/comment or not. If some one comment into the content and if admin approved it with reply, the user will have to receive an email with the reply. By the way, without subscriptions into the post and comment, sending email is not “ethical” so if you want to use it use in your own risk. Deployment of code in test/staging/production servers is one of the important part of modern web applications development cycle. Deploying code were painful because its repetitive same tasks we have to do every time we want to push code, during deployment if something goes wrong the application will go down too. But the scenario has changed, now we have many tools to make the deployment easier and fun. I have used Capistrano and Fabric for deployment. Found Fabric really painless and as its a Python battery, it was easier for me to adopt and get things done. I am going to cover fundamental operations and finally a simple fabric script(like boilerplate) for writing your own fabric script. You can use these code tasks in many different ways, to do that check the Fabric Office Documentation from here. First gist is a sample fabric script,second one is a bash script to install fabric in your ubuntu machine. I am using fabric for around two years and used for different small,medium and large projects. There are many interesting open source projects going on top of Fabric. I found these two projects really promising. Search through github,you will find many advance level Fabric use. If you are familiar with basic statistics, I think you know what is Standard Deviation, if you dont know what is Standard Deviation you can check wiki for details. And if it seems yet hard to wrap the idea into your brain,check this thread. Hope you understand it now. Standard deviation is an efficient when you want to understand a set of data and widely used in different industries. I was working with an algorithm couple of months ago where I had to calculated standard deviation of a series of data. And the sets of data is large. I switched my job,started to work in Tasawr Interactive since last September. Worked with NewsCred API, it was an amazing experience. Coz NewsCred API is a scaled solution and have large code base.I got real taste of working in a complex Python project while I worked with the API team. Worked for Indexica as a remote developer, where my role was DevOps. I had to develop a portion of their API and also managed cloud infrastructure. Worked with SOLR and Nutch for the first time and loved both of this.